Definition: Supply chain Management (SCM) refers to the management of key business processes which are related to the product flow and conversion of goods from the raw material to the goods ready for use by the final consumer. 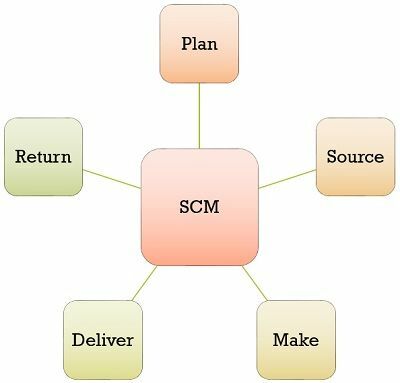 SCM involves a complete series of activities which may or may not be interconnected to one another, such as sourcing, procurement, transformation, material handling, logistics, as well as collaborating with the channel partners that assist in the process of acquiring raw material and distributing it to the ultimate user. Channel partners can be suppliers, wholesalers, distributors, retailers, dealers, third party service providers, customers, etc. Customer Relationship Management: It plans, controls and assesses customer interaction and data, during the lifecycle, with the aim of building strong relations. Customer Service Management: It assists in administering product and service contracts. Supplier Relationship Management: It guides in developing and maintaining a good relationship with the suppliers. At the time of selecting suppliers, priority is given to suppliers capability regarding quality, reliability, innovation, services and cost reductions. 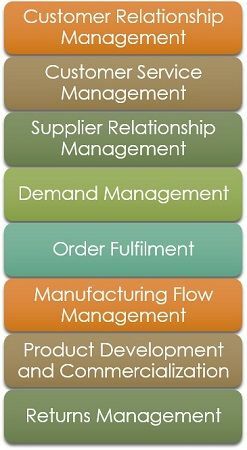 Manufacturing Flow Management: It covers activities associated with the movement of products inside and outside the factories, to have flexibility in the manufacturing process. Demand Management: A comprehensive structure is provided to best understand the customer’s needs. Order Fulfilment: It encompasses all the activities which identify customer needs, frames the logistics network and fulfils orders. Product Development and Commercialization: A framework is provided for developing and introducing new products into the market. Returns Management: It is concerned with functions associated with returns, reverse logistics etc. It is an indispensable part of the SCM process and is required in both the upstream and downstream movement of goods for the best possible use of organizations resources. Supply Chain Management is an improvement over the traditional logistics management which helps in the timely delivery of the products to customers. It also plays a crucial role in increasing business profits, by reducing the overall cost, which improves its competitiveness also. Plan: It represents a strategic segment of the supply chain management, as you require some sort of strategy to manage resource utilization for satisfying customer requirements, for goods and services. Source: Selecting the suppliers for supplying raw material to produce the product. Make: This segment is all about the production which schedules all the operations essential for production, testing, packaging, labelling, etc. Deliver: It indicates logistics, which starts with the receipt of orders from the customer. Further, it builds a network of warehouses for storing the product, choosing carriers to deliver the product to the customer and establishing a system for receiving payments. Return: This is the most critical part of the entire system, wherein a network is created to take back excess or defective products delivered to customers and also providing support services to those who encounter some problem with its usage. 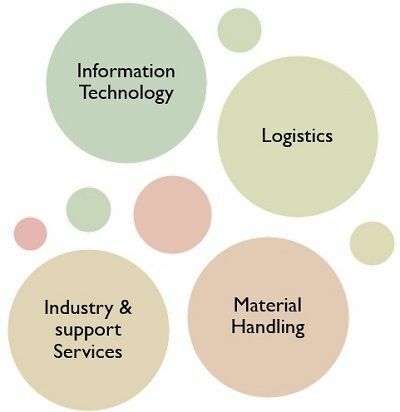 The supply chain management system brings together all the key activities like purchasing, production, storage transportation and distribution, under a single system, in order to produce and distribute the merchandise in desired quality and quantity, at right time and place, so that the overall cost is reduced and service levels are improved. Push Model: In this model, the actual demand determines the inventory to be produced. So, it is concerned with the individual customer, and it has a marketing-oriented approach. Pull Model: As per this model, the customer places the order first, after that the manufacturing of the product is done. It has a customer-oriented approach. In a nutshell, Supply Chain Management is nothing but the unification of core business functions, from the final consumer through suppliers, that supplies goods, services and information, that assist in the value addition of customers and other parties. An ideal supply chain management system has a number of benefits like inventory reduction, customer responsiveness and improvement in productivity, order management and financial cycle.